Both of my children are growing and changing, each at critical junctures in their lives. A few months shy of his 21st birthday, our son is negotiating important questions—including his major at university and where to live next year. Our daughter will soon turn 13. She’s moving into womanhood with the speed and natural grace of an Olympic runner. Her face reads like poetry—one of those poems that infuses a single word with multiple meanings. Her smile can resonate a little girl enjoying cotton-candy, while at the same instant a glint in her eye reveals a woman who is almost aware of the remarkable beauty she will become. I struggle with how much support and guidance to give each of them. If I do too much, am I giving them the message that I think they can’t do it on their own? If I don’t give them enough support, am I failing them as a mother? My father died when I was just ten years old and when my mother remarried I was about the same age my daughter is now. My father’s death and my mother’s involvement with a new man left me to essentially raise myself. I was forced to answer life’s difficult questions on my own. I don’t have a history that would guide me as to the right amount of parenting at these stages in my kids’ lives. Instead, what I do have is a wonderful partner. My husband and I listen to and problem solve parenting together. It is in the strength of our love, our devotion to each other and these wonderful people we are raising, that I know we will find the answers to the challenging questions ahead. Al and I support each other without taking over for one another. We trust each other and have confidence in each other’s abilities. 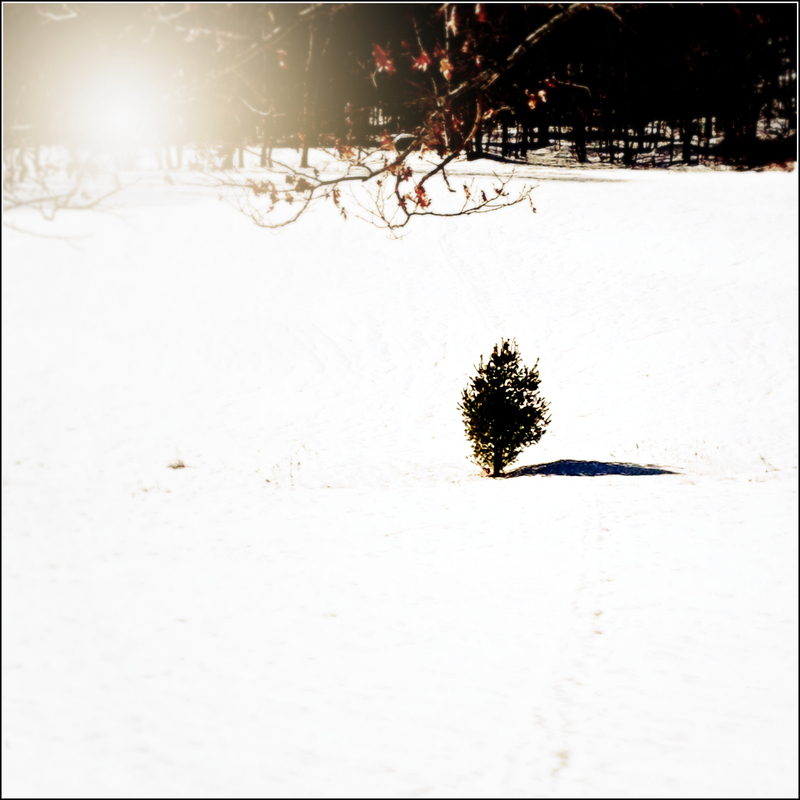 It is that kind of support that I want to offer to both of my children and hope that they find it for themselves as they navigate the ever-moving streams of their lives. Our son and his girlfriend paid us a visit last week. We are still in the midst of an intense winter here in snow-covered New Hampshire, but that didn’t stop us from taking long walks together. Afterwards, we came home to linger at family meals by the fire. I created this RichHeirloom Bean Soup after I found a bin of multicolored beans in the bulk section of our grocery store. Although they were a little pricier than average beans, I couldn't resist their charm and the sense of history cultivated within each uniquely shaped legume. Simmered with a bit of smoked ham, light chicken stock and fragrant vegetables, the beans took on a rich and complex set of flavors. 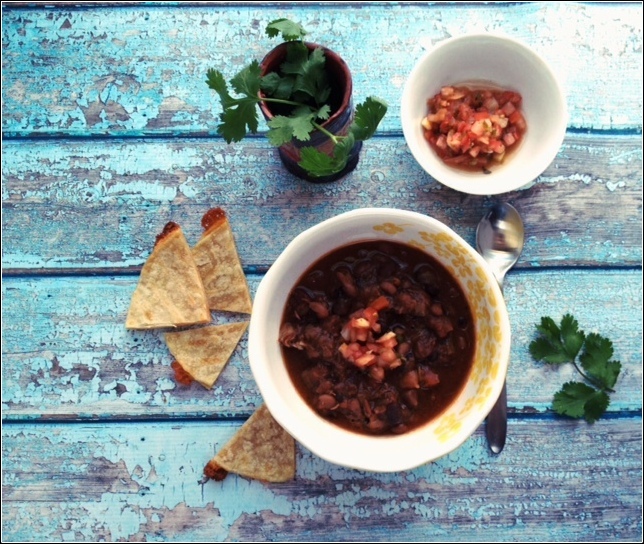 We topped steaming hot bowls of soup with fresh tomato salsa and slivered cilantro. Served with chilled beer, crisped tortillas and melted cheese, this soup was the center of a truly memorable meal. 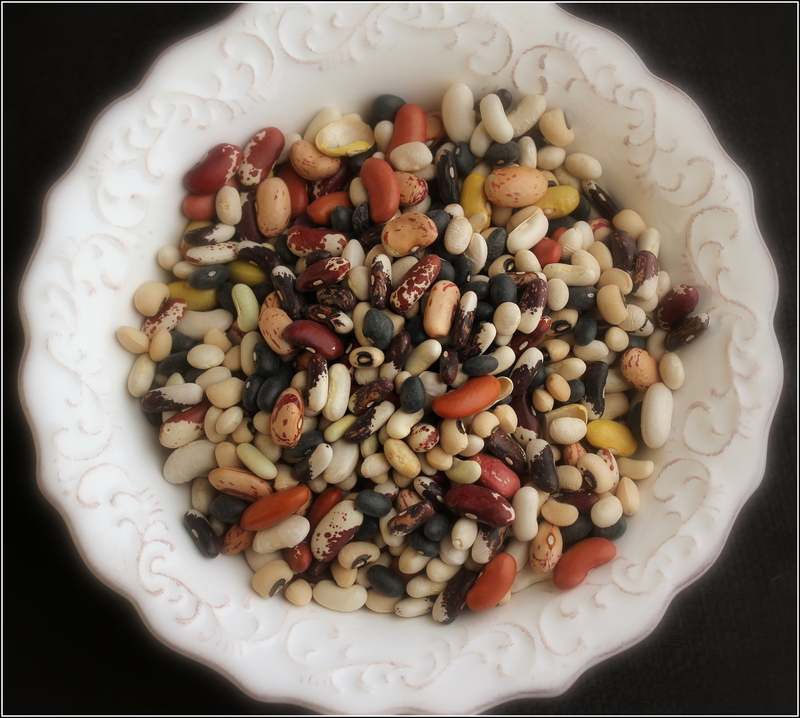 The night before you plan to make this soup, rinse the beans and place in a large bowl. Cover with fresh, cool water. Cover the bowl and let sit overnight. The next day, drain the beans and transfer to a large soup pot. Cover again with fresh, cool water. Place the pot on the stove, bring the liquid to a boil, then lower to a simmer. Simmer, stirring occasionally, until the beans are tender. This will take one to two hours depending on the freshness of the beans. Preheat oven to 400 degrees F. Rinse the ham hock and dry. Place on small sheet pan and roast in the oven until well browned, about 15 minutes. Remove from oven. While the ham is roasting, put the olive oil in a large skillet. Heat. 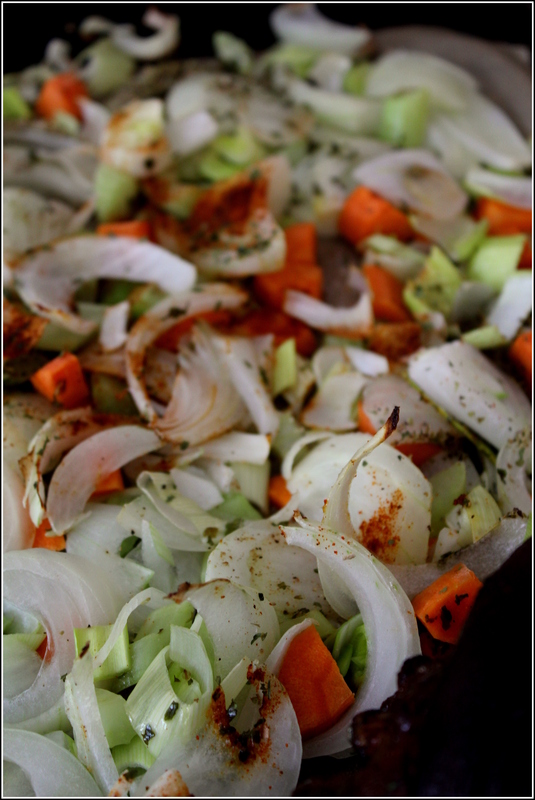 Add the carrot, celery, leek and onion to the pan. Coat with oil and cook until the vegetable are tender but not browned, stirring occasionally. This should take 10 to 15 minutes. Add the dried cilantro. and stir it in with the vegetables. Add the tomato paste, stir again, then add about ½ cup of the chicken broth. Stir everything together, bring the liquid to a boil. Give everything a stir one more time and scrape any bits of vegetable off the bottom of the pan. Pour all this into the soup pot. Add the chicken broth. Add the ham hock. Stir and bring the liquid to a boil, lower to a simmer again. Simmer for one hour, stirring occasionally. Using heat proof tongs, carefully remove the ham hock from the soup pot and place it on a cutting board. Allow it to cool slightly, then remove the meat from the bone and discard any excess fat. Return the meat to the soup pot. Add salt and pepper. Taste and adjust seasoning. When ready to serve, ladle the soup into large soup bowls. Garnish with cilantro and fresh salsa. 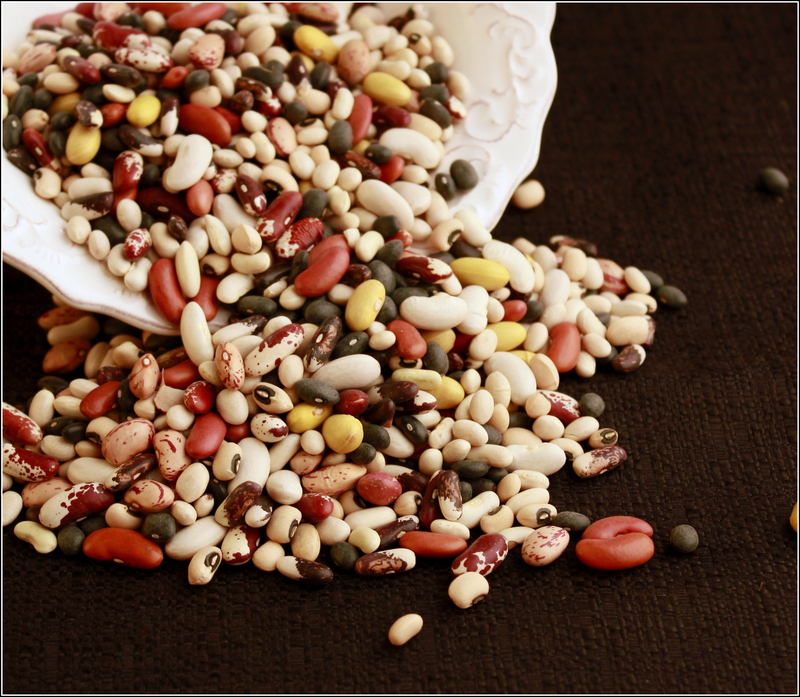 If heirloom beans are not available, use any high quality dried beans of your choice. 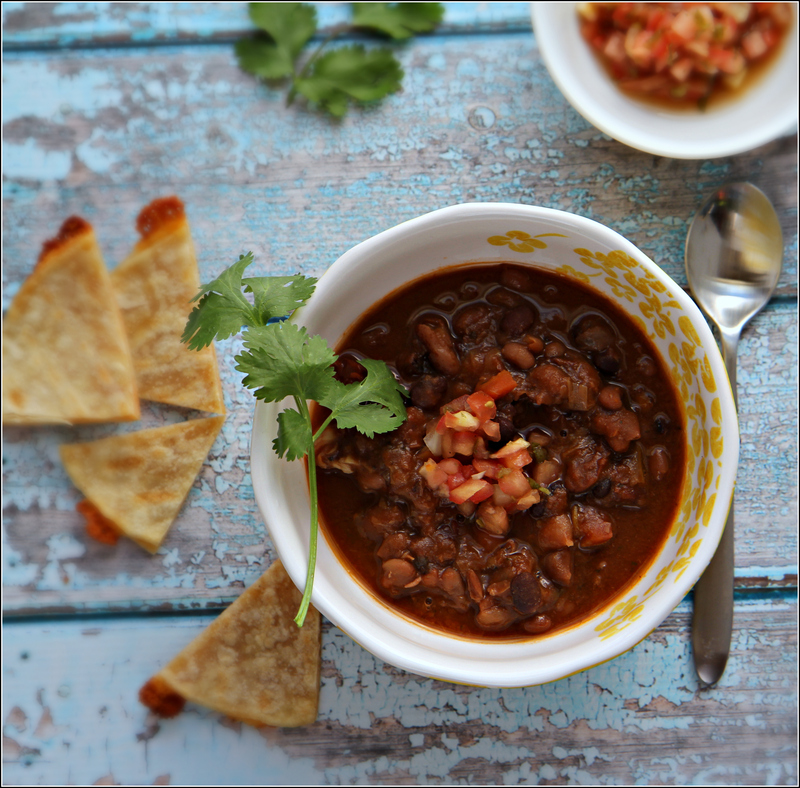 Black beans, pinto beans, navy beans or a combination for all work well in this soup. To make this dish vegetarian, leave out the ham hock and use vegetable broth instead of chicken broth instead. For a richer soup, use beef stock. Consider serving with crisped tortillas and cheese, Brown Rice Pilaf and Braised Greens, Fragrant Onion Rolls, or Twice Baked Potatoes.